HayLoft is the premier barn wedding and event destination in Western New York. We feature a meticulously restored barn more than 150 years old, approximately 100 acres of beautifully landscaped grounds, a sunken pond, both indoor and outdoor ceremony locations, bridal suite and grooms lounge, and much more! Come and tour with us and experience the relaxing atmosphere we cultivate to make your wedding the perfect day for you and your guests. Our experienced staff will make your planning a smooth process from start to finish. We can't wait to make your barn wedding just the way you want it. 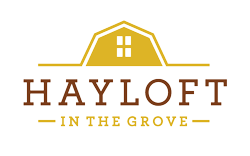 If you are thinking about a corporate event or special party, the HayLoft will provide you a unique setting for all of your guests to enjoy. "I had my wedding at the HayLoft in the Grove on September 3rd. It honestly was the most incredible day, and a huge part of that is due to Jeni and her incredible staff at the Hayloft. They were amazing to work with every step of the way and went above and beyond to make our wedding perfect. They worked with us to bring together the day we always envisioned and beyond... They are also just incredible people, they were there with us all night to make sure everything ran smoothly. So many of our guests reached out to us after telling us just how amazed they were with the Hayloft. This is a beautiful rustic and romantic venue and was exactly what I've dreamed of. We also booked the cottage next door for the after party - which worked out perfectly! Jeni and her husband have put their hearts and souls into this beautiful place and it really shines through the amazing weddings they have there." "We celebrated our wedding on Saturday 9/9/2017. I can not rave enough about this venue. Jeni & her crew are amazing to work with, I had a small hiccup a few days before the wedding and Jeni & Aubrey ensured me it is not a problem and not to stress. They took care of everything and I had no worries. The grounds themselves they keep fabulous and the photo opportunities around there are just simply amazing. Thank you HayLoft for bringing ALL my visions together. You guys are seriously so amazing!" "If I could add more stars to this review I would in a heartbeat. It was such a pleasure working with Jeni and Gabrielle from the moment we met to the day of our wedding and beyond. Jeni and her staff were on top of everything (and even sometimes a step ahead) which made for easy planning and a calm road towards the big day. We rented the house on the lot to get ready in the morning of and I'm so glad we did. The charm and warmth made me feel so happy and not to mention it looks stunning in the photos. The ease of being able to come into the space and plan everything out accordingly was amazing and no detail was left unturned. We're so happy that we chose HayLoft in the Grove for our wedding day and would recommend not to hesitate on having your special day here too. Thank you for everything!!!" "Let me start by saying this venue is stunning, from the barn to the grounds, everything is beautiful! The best part of the HayLoft is its location! We toured quite a few other barn venues, which were also beautiful, but were in the middle of no where making hotel accommodations, travel and having an after party quite difficult. Not with the Hayloft! It is literally in the perfect location only being 3 miles away from East Aurora. We worked with Jeni and Liane the most. Getting the day of coordination is a must! They handled so many details for us on the day of so that myself and my mother didn’t have to worry about a thing! We had so many compliments from our guests and it truly was an amazing day!" "Mike and I just wanted to say thank you so much from the bottom of our hearts for making our wedding the most perfect day. I know it was an insane weekend for you and your staff with having a double wedding, but you would never know it. The barn was absolutely gorgeous and set up better than I could have imagined. The day ran so smoothly and you continually checked in with us to make sure things ran smoothly. I cannot tell you how much it means to me. Not only was the venue the most perfect place for our wedding, but you and your staff were absolutely great. We really wanted to thank you, Jason, Liane, and anyone else who had a hand in our day, from the cleaning staff to your family who helped set up. Thank you for keeping me calm and reassuring me that all would be fine on the days leading up to the wedding and the day of. Thank you for making my vision come to life and for trsuting that the weather would hold out so that we could have the ceremony outside. It was a dream come true."